The removal of tattoos using lasers has been carried out for approx. 20 years. Because of the variety of different types of tattoos (e.g. amateur, professional, semi-permanent micropigmentation), it is important to find a practitioner experienced in treating a wide range. You must check the type of laser that a clinic is using for tattoo removal, as these should always be Q-Switched. Be very wary of any clinic offering tattoo removal using Intense Pulsed Light (IPL). 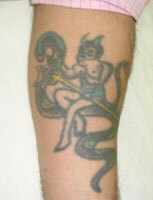 Some tattoo pigments respond well to one laser but not to another; colours like green do not respond to treatment at all. 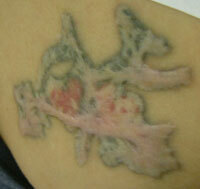 Where coloured tattoos are involved, it is a good idea to use a clinic that has more than one Q-switched laser. Repeat treatments will be required; 1 – 10 treatments for an amateur tattoo to 5 – 20 for a professional one; sessions will usually be 4 – 6 weeks apart. Prices start from £50 - £300 per session, with total cost from a few £100s for very small, blue/black tattoos, to many £1000s for large multi-coloured tattoos. We would like to thank Paul Stapleton, Mapperley Park Clinic for his expert help. The use of laser light for medical procedures began in the 1960s when they were first used in operations as cutting tools by some surgeons. Laser technology has developed over the last few decades to treat patients with a variety of different skin problems including the effects of sun damage, removal of body hair and tattoo inks, and recently the treatment of psoriasis and acne. Many people decide to get tattoos, often when they are young and impetuous, and can then go on to regret the decision later in life, especially where the tattoo features a name or symbol which they later do not want to be associated with, and which can result in psychological distress. All of this can, at worst, impact on their quality of life with regards to friends and family, or the progression of their career. Professional tattoos are those where the inks are injected deep into the lower layer of the skin or dermis, where they become surrounded by a network of collagen fibres that effectively lock them away, making removal without damaging the rest of the tissues in the skin quite difficult. Other ways of removing tattoos have relied on more extreme methods such as surgical excision and skin grafting, dermabrasion or chemical removal through salts and acid tattooing which carry significant risks of damage to the surrounding tissue, and which often result in scarring. Also, these may not remove all the tattoo pigment, thus providing disappointing results. There has been a recent resurgence of acid tattooing using lactic acid tattooed into the unwanted tattoo; marketing messages, claiming treatment to be ‘organic’ or ‘natural, confuse the reality which is that aggressive chemicals are injected into the skin with the aim of creating a deep chemical burn. It is claimed that unwanted tattoo pigment is rejected with the damaged tissue and that the healed result will be pigment free – this may be so but it is certainly not guaranteed. Beware as these services often claim to be scar-free, and may be carried out by people with no experience of tattoos or tattoo removal. 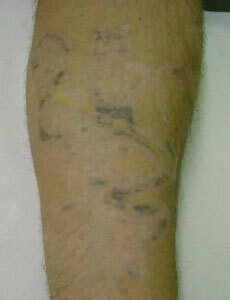 Above Image: Unusually, the entire tattoo had been treated with lactic acid tattooing (usually, only 20% of the tattoo is covered with each treatment). Silicone gel was provided to try and flatten the scarring. Image Courtesy of The Mapperley Park Clinic. The use of certain lasers, which do not damage surrounding skin and which can, with multiple treatment sessions, produce good results, have become the preferred method for tattoo removal treatment. According to 2017 statistics from the American Society for Aesthetic Plastic Surgery (ASAPS), 15 745 tattoo removal procedures were performed in 2017 in the U.S., a decrease of 42.2% on 2016 figures. If you are considering Laser treatment for tattoo removal, the following information will give you a basic understanding about what's involved. It can't answer all your questions, since a lot depends on the individual patient and the practitioner. Please ask a practitioner about anything you don't understand. What are Lasers and how can they remove tattoos? A laser produces a high energy beam of light that can precisely transfer energy into certain targets within the skin. The beam of light is produced in one wavelength (or colour) which will be preferentially absorbed by certain tattoo pigments. The key requirement for a laser to remove tattoos is for it to be Q-switched. This means that the energy is delivered in a particular way, (very short pulse-durations which ‘crack’ the tattoo pigment particles), that is effectively absorbed by tattoo pigment. Lasers that are not Q-switched will not be effective on tattoos and Intense Pulsed Lights (IPLs) will also be ineffective, delivering energy that is not effectively absorbed by tattoo pigment and which may damage surrounding skin. The most commonly used Q-switched lasers are Ruby (694nm) and Nd:YAG (532nm and 1064nm) lasers, although Q-switched Alexandrite (733nm) lasers are also available. Nd:YAG lasers can be made to produce two different wavelengths (colours) and so there are four potential wavelengths with which to target the entire range of tattoo pigments. Amateur, or simple blue/black professional tattoos will respond to Ruby, Alexandrite and Nd:YAG lasers but as soon as coloured pigments are present, the question should be asked – how do I know that this laser will remove this particular pigment? Tattoo pigments respond to laser treatment in a variable manner. Some pigments respond well to one wavelength but not to another: some colours (particularly certain green pigments) do not respond to treatment at all. Where coloured tattoos are involved, it is a good idea to have treatment at a clinic that has more than one Q-switched laser (and therefore more than one wavelength) at its disposal. The commonest laser combination is the Ruby (694nm) and Nd:YAG (532nm and 1064nm), which together deliver 3 wavelengths, greatly increasing the chance that there is an effective wavelength available for each pigment. Some pigments will not respond to any available wavelength and some pigments, especially modern, pastel, white or ultra-vivid pigments may respond by turning brown or black. These residues then may, or may not respond to further treatment. Semi-permanent or micro-pigmentation pigments may be particularly difficult as they are often blends of ‘earth’ toned pigments, often containing iron-oxide compounds which commonly turn black on exposure to laser light. It is essential that careful test patching is carried out on any micro-pigmentation inks to ensure that the pigment will respond without making matters worse. In anything but the most predictable case (blue/black), it is essential that you have a clear idea of the worst-case predicted outcome. A skilled practitioner will be able to help you to predict the worst case, which if acceptable to you, will be the basis of the agreement to treat. If the worst case scenario is not acceptable, you should be wary of continuing because you are unlikely to be happy with the outcome. Test patching potentially difficult colours is the only way to check response and it may take multiple visits to find out whether a particular pigment will respond. Some clinics may advertise the use of IPL machines or non Q-switched lasers for tattoo removal, however clinical data so far doubts that these devices are suitable or safe for tattoo removal as they do not produce the targeted bursts of high energy required to break down the pigment particles without affecting the surrounding tissue. You should therefore be wary of any clinic offering tattoo removal who claims this can be done using an IPL device. Depending on the area of skin where the tattoo is located and the type of laser to be used, treatment technique will be individually tailored for you, and a “patch test” may be recommended where the laser system is fired on a small area of the tattoo to see how the skin and the pigment responds prior to a full treatment session. A treatment programme could therefore be anything from 1 – 10 treatments for an amateur tattoo to 5 – 20 for a professional one. Treatment sessions will usually be 4 – 6 weeks apart. Due to the depth of treatment required to remove tattoo inks, the treatment is generally considered to be painful, although this will vary from person to person due to different tolerances to pain. A stinging or burning sensation will be noticed during the procedure, and the area treated may feel hot for some time after treatment. Your practitioner can advise on ways to alleviate any pain and discomfort during treatment with topical anaesthetics and cooling devices. During treatment, most patients will experience small white dots which appear on the skin for several minutes after each firing of the laser – this is only water, vaporised by the heated tattoo pigment, and fades within a few minutes. After the treatment, minor bleeding may occur, with skin redness, swelling and oozing, plus blistering appearing over the treated area. The treated area may also feel very tender to the touch. This will fade over a few days. Once any blistering, crusting or scabs have resolved, the area of skin over the tattoo will look shiny for a number of weeks. It is vital that the skin is well looked after immediately after treatment. The treatment site should be considered as a minor burn and should not be picked at, and blisters should not be popped. There is a risk of infection if the area is not properly looked after. Once the skin has returned to normal, generally after 4 – 6 weeks, then repeat treatments can be performed. Scarring - as these lasers do not heat up the surrounding tissue to a great degree, the risk of scarring following tattoo removal is considered to be very low. In the rare cases where scarring may occur, this is generally due to either a history of scarring (some people scar very easily) or poor treatment site healing, generally caused by the patient picking at scabs. Extreme multiples of treatment (30+), as a result, for example of a very resistant green pigment within the tattoo also increase the risk of scarring although in all cases, scarring risks can be alleviated by the use of silicon scar-reduction gel. When post-treatment advice is followed, the risks of infection are very low. In case of any infection, intervention is usually the prescription of a topical antibiotic cream. Patients generally not suitable for any form of light treatment are those who have a history of skin sensitivity to light or scarring problems, an active herpes (cold sores) infection or other skin infections such as impetigo at the site to be treated. These conditions should be individually assessed and treatment may continue where the underlying condition is addressed. Darker skin-types may be treated but all risks outlined above increase with the darkness of the skin. For example, it may not be helpful to remove a black tattoo from dark skin and leave in its place a light patch with the same shape. Recently tanned skin should not be treated. Active melanocytes (the cells which produce melanin) are readily targeted by Q-switched lasers and the damage done is likely to lead to long-term hypopigmentation (pale patches of skin). Patients who have used isotretinoin – a powerful photo-sensitiser - in the last 12 months would also not be suitable candidates. Generally light systems for the removal of tattoos are used by doctors, surgeons or nurses, although anyone who is ‘appropriately trained’ may legally use a laser. The key is experience. Tattoo removal is probably the laser treatment with the most variability – both in terms of how good the end result is and the cost. In everything but the simplest blue/black tattoo, there are many challenges and you should be comfortable that your practitioner has the correct range of equipment and the experience to use it. Be wary of anyone who makes it sound too good to be true – it probably is! Is Laser Tattoo Removal available on the NHS? It is very unlikely that you will be able to access tattoo removal treatment free of charge via the National Health Service (NHS). However, certain regions do make special cases if there is a psychological problem associated with the tattoo, and we would always recommend that you visit your General Practitioner before embarking upon treatment. What is the average cost of Laser Tattoo Removal? Treatment costs for tattoo removal vary depending on the size of the tattoo and the type of tattoo ink used, as this will have a bearing on the number of treatment sessions required. There may be an initial consultation fee, or fee for a test patch of skin to be evaluated. This will normally be in the region of £25 - £50. Private prices for tattoo removal start from approximately £50 to £300 per session, with total cost running from a few hundred pounds for very small, blue/black tattoos, to many thousands for large multi-coloured tattoos. Multiple treatment sessions are almost certainly required, so a programme of several treatment sessions paid as a package is usually cost effective. The development of lasers has allowed practitioners to remove the varying different types and colours of tattoo pigments with increasing safely and effectiveness. Lower cost equipment has encouraged more practitioners into this market, making the treatment widely available. This trend is likely to continue as more clinics adopt their use. More young people are currently getting tattoos than ever before and may ultimately regret that decision 10, 20 or 30 years down the line. Research suggests that 70% of people with tattoos eventually regret having had it done. Because of the variety of different types of tattoos (e.g. amateur, professional, semi-permanent micropigmentation etc.) that can be treated with these machines, we cannot stress strongly enough how important it is to find a practitioner experienced in treating a wide range of tattoos. As some of these systems are available in cosmetic clinics and specialist laser clinics - you must do your homework to make sure that they have the right equipment and training to treat you safely and effectively. 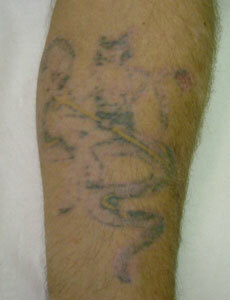 An old, professional tattoo with predicted difficult colours on a male patient. After 7 treatment sessions with Ruby and YAG lasers - only greens (darkened), red and yellow remain resistant. After 15 treatment sessions - greens and red continue to fade slowly - yellow is not going to respond. Note: skin depigmentation - this will improve but may not recover completely (freckled skin-types recover poorly). A modern professional tattoo with predicted difficult colours on a female patient. After 5 treatment sessions - all black gone - green, red and yellow remain. This tattoo will fade to completion. Again, depigmentation is an issue - the background colour will return but freckling will not. Images provided courtesy of The Mapperley Park Clinic. Click for ALL Laser Tattoo Removal clinics in the UK & Ireland registered and verified by Consulting Room.